Eye illuminators from Estée Lauder, mark. and Covergirl! Estée Lauder Idealist Cooling Eye Illuminator - 15ml - $72 - in Light/Medium and Medium/Deep - offers brighter, more rested-looking eyes by reducing the appearance of dark circles, puffiness, shadows, and fine lines to leave eyes looking brighter and awakened. Best part is the specially contoured cooling applicator that refreshes the eyes at first touch. Available at Estée Lauder counters across Canada. mark. That's Brilliant Face & Eye Luminizer - 15ml - $16 - a lightweight, liquid illuminator that creates radiant skin with a sweep of the handy built-in applicator brush that can be used anywhere on the face, including under the eyes to brighten and bring radiance to the skin. Available from your Avon rep - 1800-265-AVON or online at www.avon.ca. 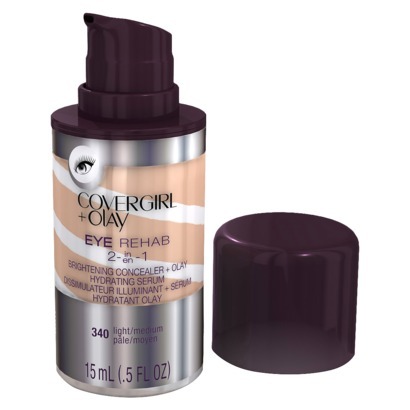 Covergirl + Olay Eye Rehab 2 in 1 - 15ml - $10.99 - in Fair, Fair/Light, Light, Light/Medium and Medium - a brightening concealer with Olay hydrating serum that colour corrects and conceals to cover dark circles, brighten eyes instantly, and even out skin tone over time. Available at drug and mass merchandisers across Canada. Labels: concealer, CoverGirl, Estée Lauder, eye brightener, illuminators, mark. The mark. That's Brilliant Face & Eye Luminizer is on my to-try list. It may help with my slightly noticeable dark under eye circles.